There’s a certain kind of irony that feels both ridiculous and sublime when, while heading up a convoy of brand new Lexus LC 500 cars along the rain slicked roads of Victoria’s Mornington Peninsula, you realise that you’ve been humming along to Leader Of The Pack for a good two minutes without realising. For the uninitiated, the 1964 dirge is a half-sung tête-à-tête between three teens about a pair of star-crossed lovers who are kept apart, essentially, by class divisions and a disregard for the speed limit. That’s where any similarities between The Shangri-Las’ lament to love lost in a road accident and my introduction to two new leaders of their respective packs end. Except for the fact that for the fictitious narrator Betty and myself alike, both experiences would prove to be largely unforgettable. Doot Doot Doot is not another nonsensical group vocal harmony from the doo-wop era. Instead, a Doot Doot Doot is – bear with me – the head of a Flaggerdoot, the collective noun for a herd of jackalopes, which is a portmanteau belonging to both a horned hare creature in North American mythology and the most recent addition to the country’s relatively unhurried high-end hotel landscape. Three years ago, Jackalope Hotels owner Louis Li bought the adjoining vineyard Willow Creek, and with it, planning permission to build on a relatively small site. 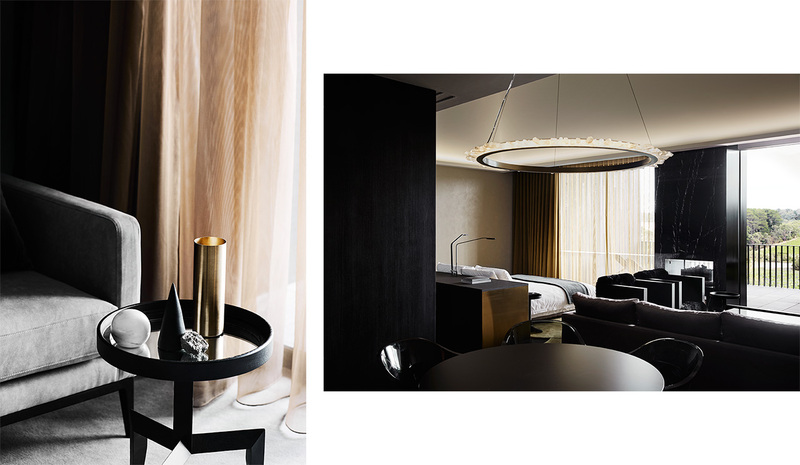 Two years ago, the hotel broke ground armed with plans by Melbourne’s Carr Design Group for a 46-room hotel unlike many (if any) hotels in Australia. Two months ago, Jackalope opened its doors to near instantaneous acclaim. Ordinarily, those details would read par for the course, but they’re made all the more impressive for the fact that this is filmmaking student turned entrepreneur Li’s first venture at just 29-years-old. The scope of its founder’s vision, and the finesse with which it has been executed, is integral to the Jackalope story – and everyone involved in all facets of the hotel loves a good story. As the story goes, according to General manager Tracy Atherton (formerly of luxury leviathan Aman Resorts and Canberra’s Hotel Hotel), Li first discovered the myth of the jackalope in an antique shop in Berlin, but there’s very little of his first passion project – at least three Jackalope-branded hotels are slated to follow – that’s redolent of the past. Instead, the hotel is embedded as deep into the current moment as it is in the vineyards, kitchen gardens and orchards over which it looks. 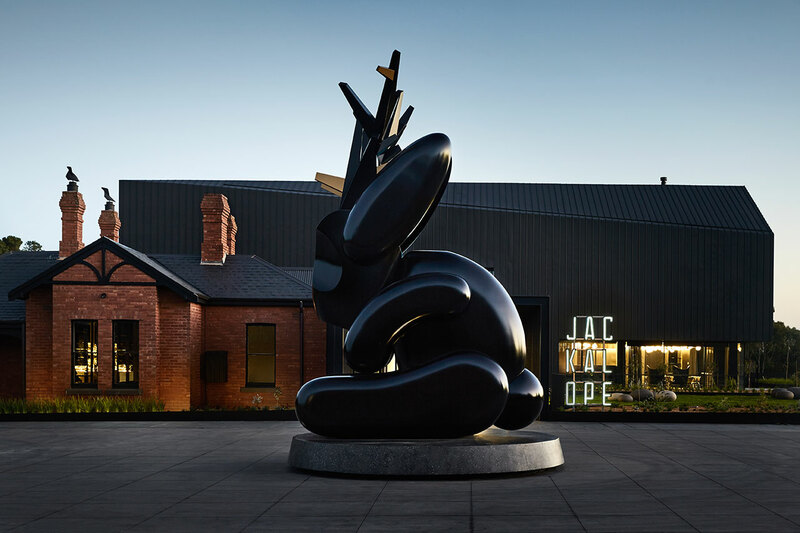 Then there’s the eponymous, seven-metre-tall jackalope sculpture, which greets visitors on arrival and acts as both gatekeeper to and an analogue of the hotel’s mission statement: a striking hybrid of design and storytelling, detail and grandeur, warmth and ferocity. 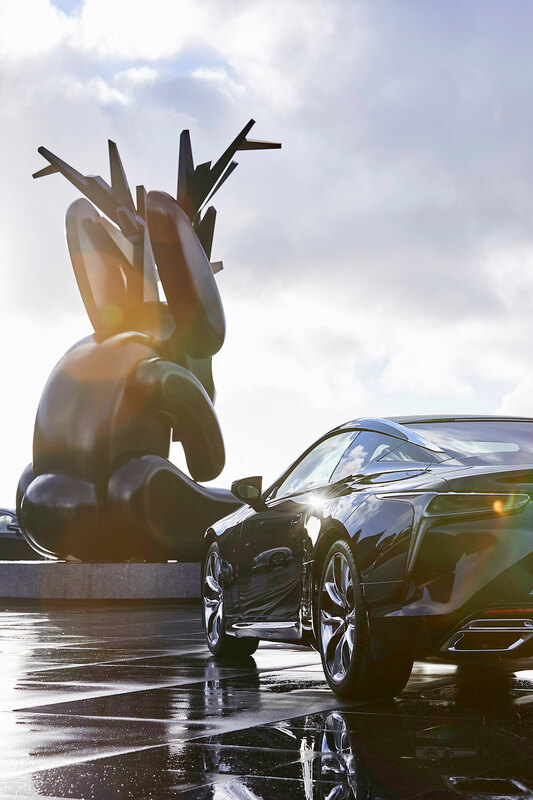 It’s an electric dynamic the hotel shares with the stunning new Lexus LC 500. Launched earlier this month at Jackalope, the vehicle has enjoyed a similar gestation period to Li’s hotel having first been unveiled as a concept in Detroit in 2012. Very little has ostensibly changed of the original vision from what you see today, aside from a view cursory details – what has now been dubbed the world’s slimmest headlight unit, for example, required that suspension engineers change manufacturing components to give the car its sloping, aggressive stance. That sense of aggression carries through to what’s under the bonnet, naturally (the world’s first 10-speed transmission in a luxury car, for those of you playing along at home), but as any disingenuous aesthete will tell you, it’s what on the inside that really counts. The Japanese philosophy of takumi, or ‘artisan’, inspired the exacting craftsmanship on display in the cabin. Picture the seats, which underwent more than 50 design changes over two years before a final version in buttery leather was decided upon; or the 13-speaker, 918-watt Mark Levinson audio system, which delivers a symphonic performance – even if what you’ve inadvertently stumbled upon on the radio is one of pop music’s most keening laments. And while the LC 500’s infinity bulb taillights leave a lasting impression (ample mirrors are used to create an impression of endless depth), few sights could compare to the lightbulb moment that anchors Jackalope’s flagship restaurant, Doot Doot Doot. 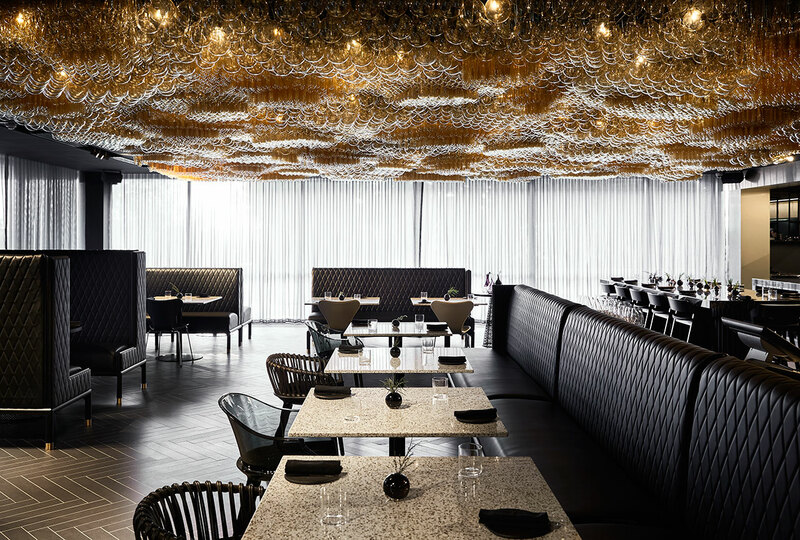 Here, under a ceiling lined with 10,000 champagne-hued Edison bulbs of varying shapes installed by the Melbourne chandelier designer Jan Flook to mirror the fermentation process, Executive Chef Guy Stanaway issues the first of two culinary offerings deeply anchored in seasonality and locality. 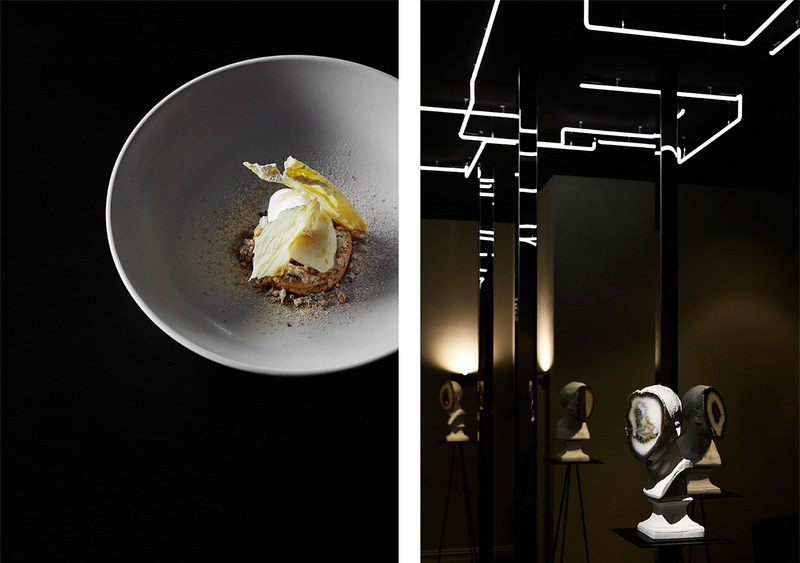 Both the restaurant and its lighting feature are an extension of Li’s fixation with the alchemical as a recurring narrative element laced throughout the hotel and its adjoining Rare Hare cellar door and kitchen. You can sense it as much in the Rolf Sachs beaker lights in Flaggerdoot, the hotel bar, as in the neon lights that line the central hallway or the alchemical signs that mark the doors throughout. For Stanaway, that endless quest to turn base produce into something precious evinces itself most clearly in a set menu of winning dishes across the board, like Fraser Island spanner crab cooked in dashi butter, a purée of local potatoes, furikake and house-made bottarga. 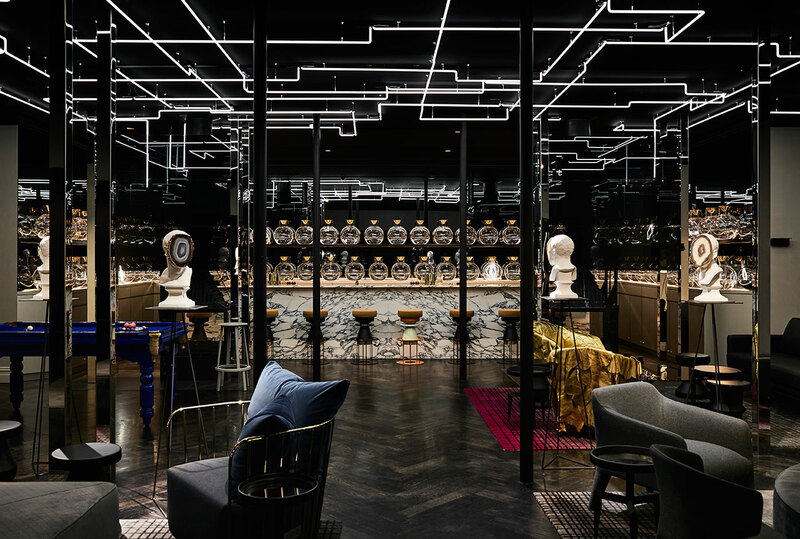 For Li, it’s in the cross-pollination of form and texture in the hotel’s public and private spaces alike, like Flaggerdoot’s commingling of herringbone parquetry, brass and marble with pieces that speak to his esoteric taste and those of Zuster: Edra’s gold Leather Works chairs, Peninsula artist Andrew Hazewinkel’s installation of agate-faced busts The Conversation, or the solitary Stag bench by Rick Owens – the only piece of Li’s favourite designer’s furniture in Australia. A little more ancient lore is welcomed where the food and wine offering at Rare Hare, the cellar door, are concerned. 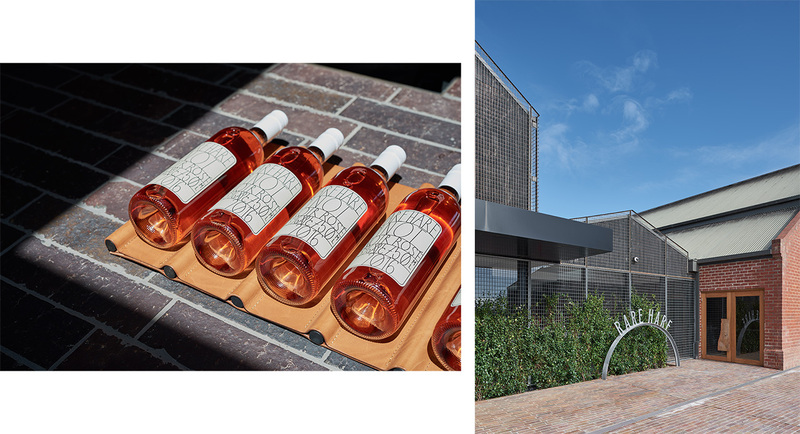 For the latter, head winemaker Geraldine McFaul has created an array of fruit-driven wines in keeping with the space in which they’re created – wines that are rewarded with immediate drinking (“not a lot of thinking,” she adds) while remaining textural enough to provoke intrigue, a combination, she says, that was intended to reflect the story of the hotel itself. Jackalope’s rooms, thankfully, require a great deal less rigorous thought. Floor-to-ceiling windows provide uninterrupted views of the rolling hills beyond and the black 30-metre infinity pool below. 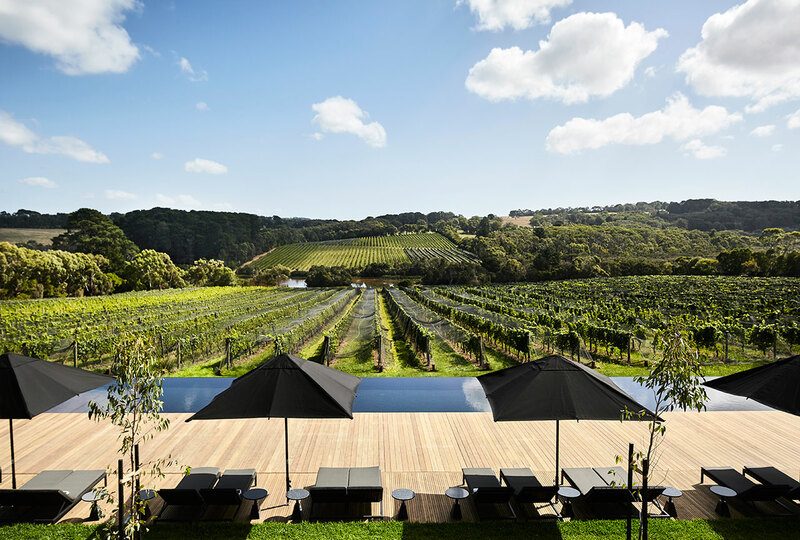 Should the Mornington’s temperamental climate dictate that bathing al fresco be removed from the menu, deep-soak Japanese bath tubs and toiletries from Melbourne’s Hunter Lab, including a body scrub made using grapes from the vineyard, prove to be just as restorative as a glass of citrus-driven Willow Creek sparkling chardonnay after a day spent keeping up with an entirely new breed of design-driven pack masters. One more thing about that Shangri-Las’ song. Sixties songwriting impresario George ‘Shadow’ Morton originally wrote the teenage tragedy anthem for a band of his protégés called The Goodies, who, when they first began singing publicly, performed under the moniker The Bunnies. They recorded a version of the song that would never be released, with record label machinations dictating that the song be released by the Shangri-Las instead, for whom it would go on to become the kind of pop chart topping hit still recognisable today to an absentminded millennial driving a luxury car down a rugged stretch of Victorian coast. At least where Jackalope is concerned, it looks as though one bunny has finally landed that elusive number one. 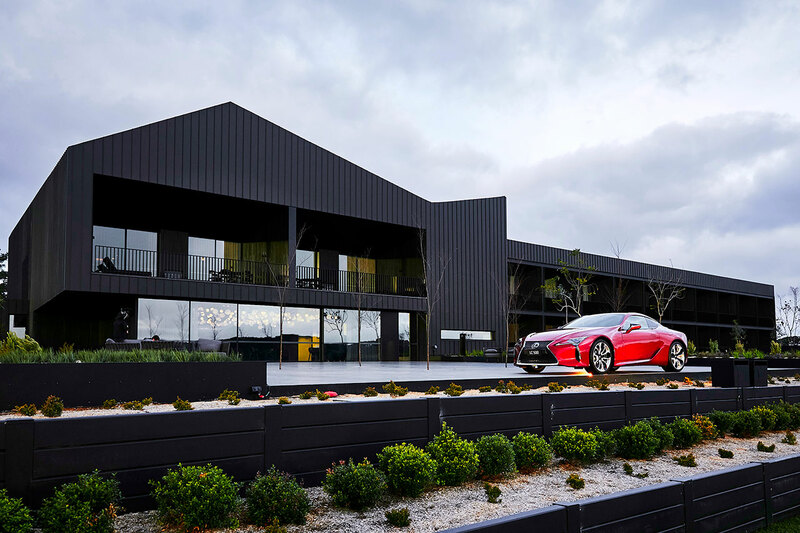 Grazia travelled to Jackalope as a guest of Lexus. Find out more about the new Lexus LC 500 and Jackalope here.